Short ribs aren’t the default cut of beef for shredding anymore! 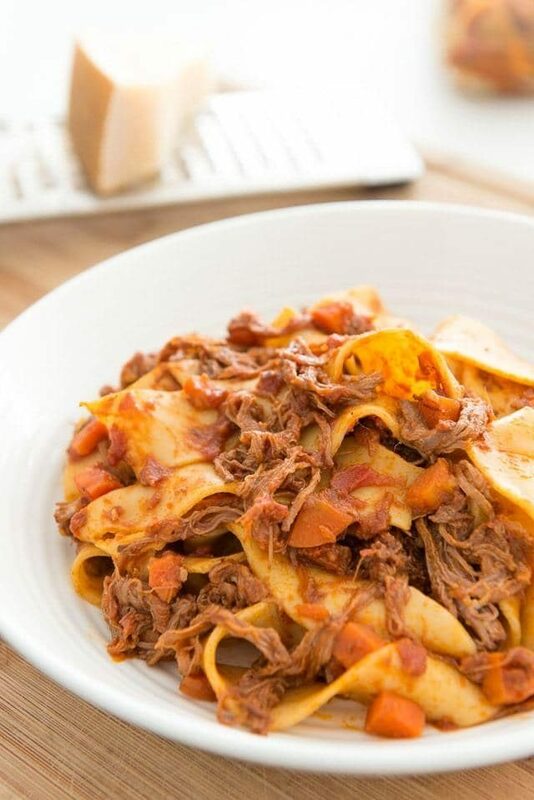 Flank steak is a lot leaner and shreds beautifully for this Slow Cooker Beef Ragu. This is the perfect weeknight meal, cooked low and slow for 8 hours and ready to toss with your favorite pasta. 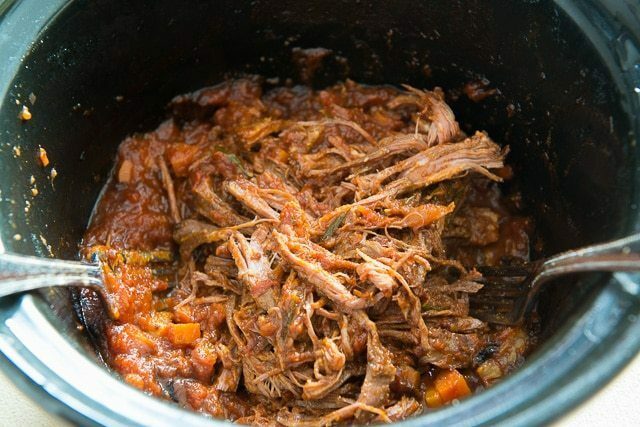 Shredded beef has always been one of my favorite things to eat, and for most of my life, I always thought of short ribs as the default shredded beef, like these slow cooker short ribs. They fall apart with the prod of a fork so beautifully and become really tender after several hours of cooking. 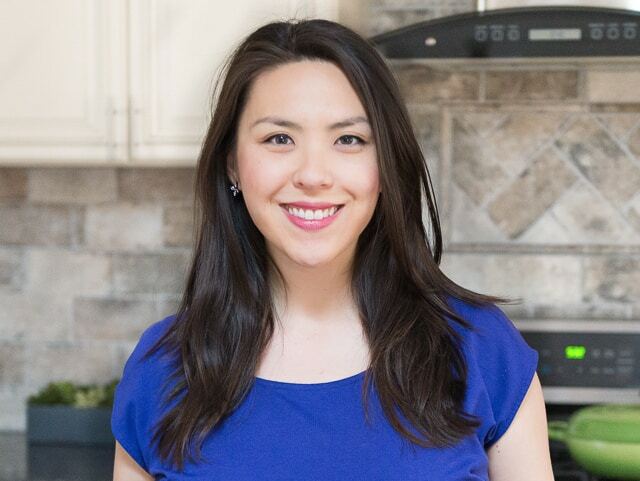 A while back I discovered via my friend Gina’s cookbook that there was a leaner alternative that still shreds beautifully, and the magical cut is…flank steak! This surprised me, because flank steak in my head was always something you grilled and enjoyed rare, cut again the grain. 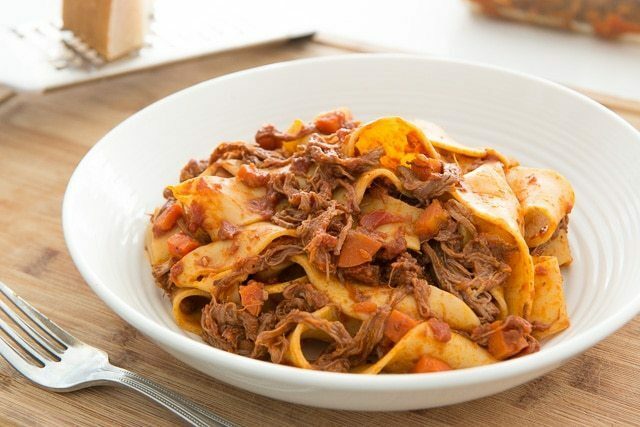 Not something you cooked in the slow cooker for 8 hours and shredded with pasta. Well, since this discovery, I’ve made variations of this pasta probably about 15 times. It’s so easy to make, and has become a staple in my weeknight dinner rotation. You can see the grain runs left to right, and if you cooked this piece whole, you’d get strands of beef that are just as long as the cut is from left to right. Practically as long as noodles. 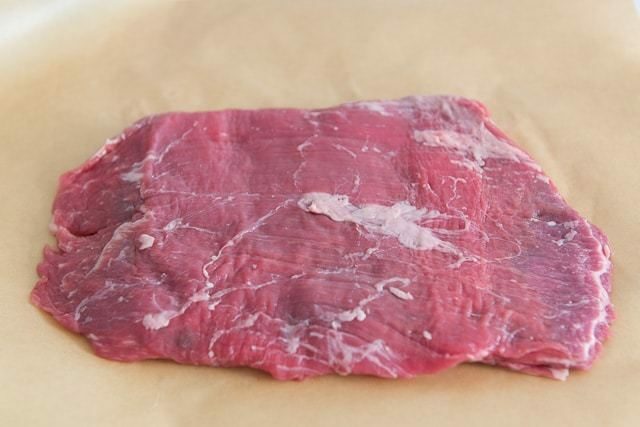 Then cut the flank steak in half or in quarters to make the strands shorter. Serve with grated parmesan if desired. Leftovers keep beautifully! Make sure to use a good quality marinara sauce for the recipe. Since there’s not a lot going on here, it’s necessary to splurge on the premium jars of sauce, such as Rao’s. Homemade Lasagna is another one of my favorite Beef and Pasta comforting meals. I also love this Steak Salad for something lighter. Enjoy! Short ribs aren’t the default cut of beef for shredding anymore! 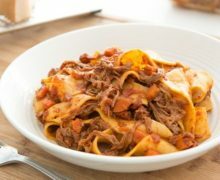 Flank steak is a lot leaner and shreds beautifully for this ragu, cooked low and slow for 8 hours and tossed with fresh pappardelle pasta. Season the flank steak on both sides with salt and cracked black pepper. I seasoned with a total of 1/2 tsp salt distributed between both sides. 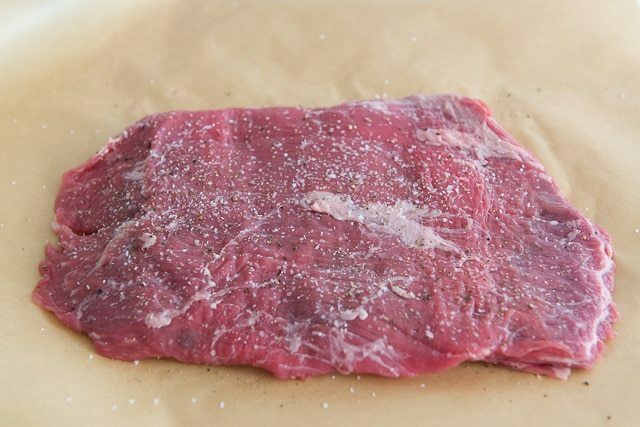 Cut the flank steak in half or in quarters so the strands of beef are shorter. 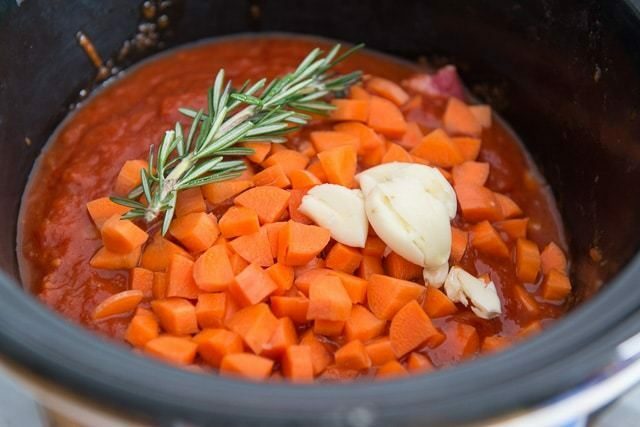 Place the flank steak in the crock of your slow cooker, along with the marinara, carrots, rosemary, and garlic. Cook on low for 8 hours, until the flank steak shreds easily. 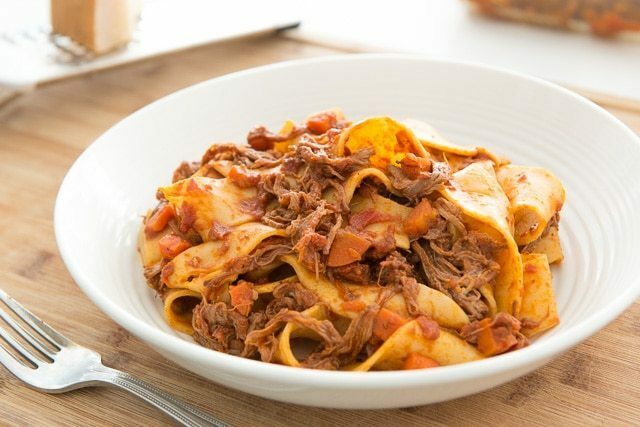 Shred all the beef, then toss with the fresh pasta. Serve with grated parmesan, if desired. Enjoy! Posted updated November 2018. Originally published April 2017. 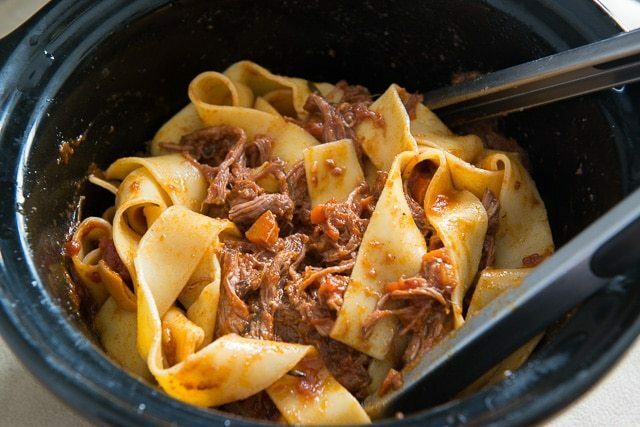 Anything slow cooker is a major YES in my home. It makes life so much easier on those busy weeknights! This was my very first crock pot meal! My daughter gave me her crock pot as a hand-me-down when she got a new fancier model for her bridal shower! Cannot believe this really worked! I used a 2.2 pound flank steak and 1.5 pounds of fresh pappardelle. Huge hit!! Thank you! Hi Elise, that’s fantastic! Glad you enjoyed it so much!